The Alfa Romeo is famous for its grand touring cars. It has made its production lines to manufacture the sporty and casual cars. Though they are still struggling, they are improvising their ways of production. The R&D of Alfa Romeo worked hard to invent an SUV that could not only be a hitchhiker, instead, it should even have the grand touring instincts. Actually, Italians are well versed in producing grand touring cars. But the concept of SUVs is pretty less over there. By the way, whenever you visit Italy, you may find a lot of city cars rather than exotic cars. Well, during the Los Angeles Auto Show 2016, the Stelvio was introduced for the first time. It was never a surprise that Alfa Romeo launched an SUV. As we had witnessed an SUV from Alfa Romeo in the past. And not to forget, the Stelvio is designed on the footprints of its concept. That was the Alfa Romeo Kamal, certainly so Kamal. 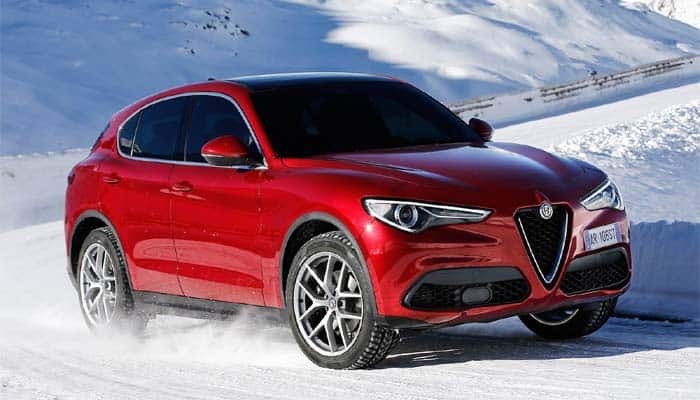 By the winter of 2016, the Stelvio went into the production. And in 2017 the initial models for the year 2018 were introduced. It was already planned that Stelvio would be introduced for the year 2018. The design of Stelvio is not much similar to the concept Kamal. But the mechanical orientation is much similar. Though Kamal was introduced in 2003 but its instincts are even living today. Well, Stelvio is available with a number of drivetrain options. The Stelvio Ti and the Quadrifoglio are the upscale versions of this SUV. The base price of this car is $41,995 while the finest model is available for more than $75,000. Further, there are plenty of options available for this car. So never expect that you would be paying less than $45,000. 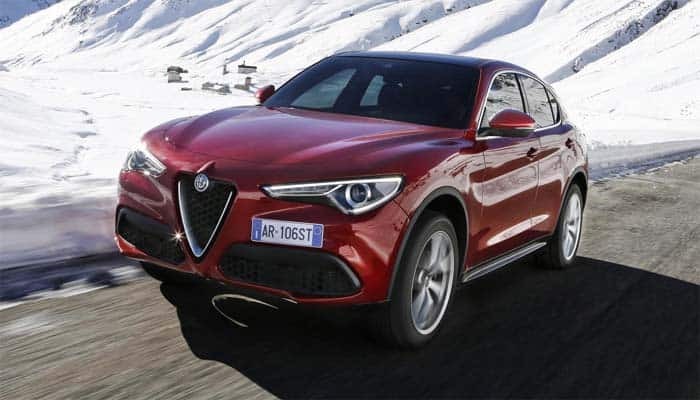 The Alfa Romeo has offered a wide range of performance mechanism in Stelvio. This all begins with the 2.0 L turbo-4 engine. That is the base drivetrain of the Stelvio series. Well, this 2.0 L turbo-4 has 197 hp of power at 240 lb-ft of torque. Next in the series is the highly tuned 2.0 L turbo-4. It offers 280 hp of power at 306 lb-ft of torque. This is the base drivetrain offered in the North American market. Further, the 2.9 L twin-turbo V6 is only available in the Stelvio Quadrifoglio. Well, these are the gasoline drivetrains. And all-wheel-drive configuration is standard for the gasoline versions. Ahead of these, Stelvio is also available with the diesel engines. The base diesel version comes with the 2.2 L inline-4 engine. The standard engine offers 148 hp of power with 330 lb-ft of torque. With the tuned version offers 178 hp. Well, the base all-wheel-drive diesel even has 178 horses. But the upscale version gets 207 horses at 350 lb-ft of torque. The 8-speed ZF automatic transmission is standard for all the drivetrains of Stelvio. Well, that is certainly strange that the 4-cylinder and the V6 both share the same transmission system. During all our tests we missed the manual transmission in the V6 Stelvio. Well, it would have done better if there was anything manual. But this automatic is not even bad. It went through all the thick and thin pretty decently. But it did not have that much thrust that a manual transmission could give. Well, the handling is pretty confident. It does not feel like an oversteer version of a sedan. Instead, it has its own crisps and tremendous braking response. Certainly, it has one of the finest handlings in its class. 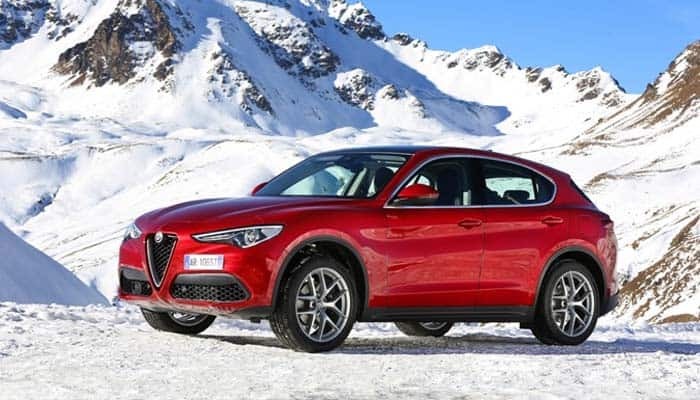 The Alfa Romeo Stelvio is an SUV. Well, what would you expect from an SUV? Aggression, strength, and power? Stelvio does give an aggressive look but it is more like a delicate aggression. It has the same signature grille in the front like all other cars from Alfa Romeo. Further, the details involve some handsome amount of aerodynamics. That amount is sufficient to maintain the performance of this car. Well, the Alfa Romeo Stelvio comes with the 19-inch alloy wheels. Along with that, some designs are optionally available on 20-inch alloy wheels as well. The headlamp crisps are amazing. While the tail lamps even have the same design. Stelvio is a bit lengthier than its competitors. The roof fall is standard but the rear is a bit extended. Usually lengthier cars have a bit poor performance. But that is not the case with this SUV. When you get inside Stelvio you meet a neatly designed interior. Alfa Romeo has invested some serious kind of though in amplifying the interior of this SUV. Premium leather and carbon fiber accents are the basic ingredients for the interior. It is a wholesome luxury with a lot of comforts. The cockpit and the front row passenger seats are quite comfortable. In the cockpit, you would find every essential control that can help you drive Stelvio with ease. While the back row is even quite spacious and comfortable. And when it is about the grocery and the cargo space, then Stelvio has plenty of space at the back. Further, you even get the split fold-down of 40/20/40 to enhance the cargo capabilities of this car. 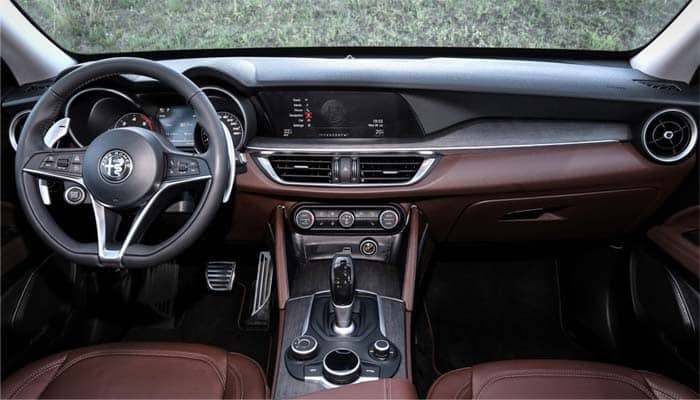 The standard Stelvio comes with the 6.5-inch touchscreen infotainment system. While the Stelvio Ti gets the 8.8-inch screen. 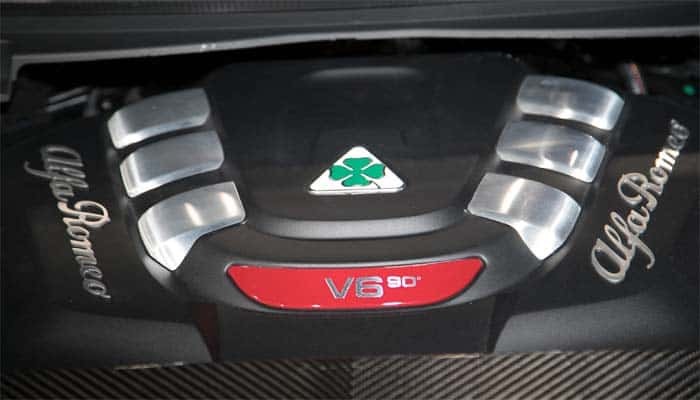 These systems run on a custom developed platform that is available in all other Alfa Romeos. Ahead of that, the 7-inch driver’s cluster display with customizable options is standard. The 8-speaker audio system comes standard in these models. While an optional 14-speaker Harman Kardon Premium audio system is available with 12-channel Class-D amplifier. Further, the telephony, internet, navigation, and music storage are also available. And this is all you can get from this car. The Euro NCAP rated 5-Star to the safety of Stelvio. It is quite rare to experience an SUV earning 5-Stars in its safety test. Well, thanks to Alfa Romeo for placing the right safety equipment in this SUV. Besides the standard passive safety, we get the braking assistance, rearview camera and parking sensors in the LOT of active safety. 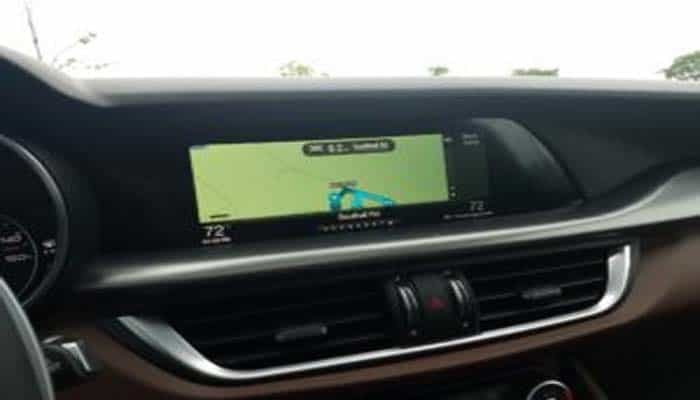 Further, the Stelvio even gets the forward collision warning and it comes really handy while driving at Stelvio Pass. There are very few reasons for considering Jaguar F-Pace over the Alfa Romeo Stelvio. 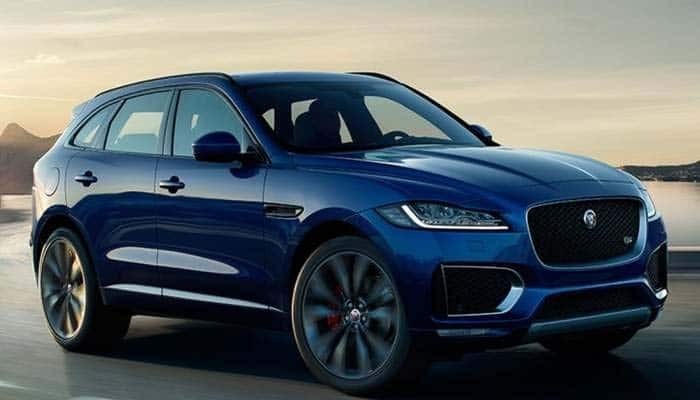 Well, F-Pace is even a blend of luxury and performance. But the cosmetic design, interior, and performance in both these cars are almost similar. Well, Stelvio is a very nice GT hiking and mounting option. It has comfort, pleasure, and power. But the cost could be a major factor.